Deliveries of the Cayenne, Porsche's best-selling model, more than doubled to 10,292 SUVs in its fiscal first quarter. BERLIN (Bloomberg) -- Porsche Automobil Holding SE, the maker of the 911 sports car, said operating profit surged more than sevenfold in the fiscal first quarter on demand for the Cayenne SUV and Panamera sedan. Earnings before interest and tax advanced to 395 million euros ($526 million) between August and October from 52 million euros a year earlier, the Stuttgart-based manufacturer said in an e-mailed statement. Sales climbed 80 percent to 2.1 billion euros. Deliveries of the Cayenne, Porsche's best-selling model, more than doubled to 10,292 SUVs, while the Panamera, which went on sale about a year ago, also almost doubled to 5,778 cars. Porsche, which will switch to calendar-year reporting in 2011, expects a return on sales that is “clearly” more than 10 percent in the last five months of 2010, it said today. “It's a fairly good set of numbers and clearly highlights that Porsche's core business is doing well,” said Alexis Albert, a Nomura Securities analyst in London with a “reduce” rating on the shares. Porsche gained as much as 2.83 euros, or 5.3 percent, to 55.90 euros and was up 4.8 to 55.64 euros as of 11:17 CET in Frankfurt trading, valuing the company at 9.73 billion euros. Porsche is in the process of merging with Volkswagen AG, Europe's largest carmaker. VW acquired 49.9 percent of Porsche's car-making unit after Porsche last year failed in a hostile takeover attempt for Wolfsburg-based VW. Porsche's first-quarter European deliveries rose 63 percent to 7,082 cars, of which 2,318 were sold in Porsche's German home-market. North American sales totaled 6,632 units, the manufacturer said, without providing year-earlier figures. “Porsche continues to be on a profitable growth course,” Matthias Mueller, head of the automotive division, said in the statement. Volkswagen agreed to combine with Porsche in August 2009 after the sports-car maker's debt tripled to more than 10 billion euros following a failed bid to buy VW by securing stock through options trading. 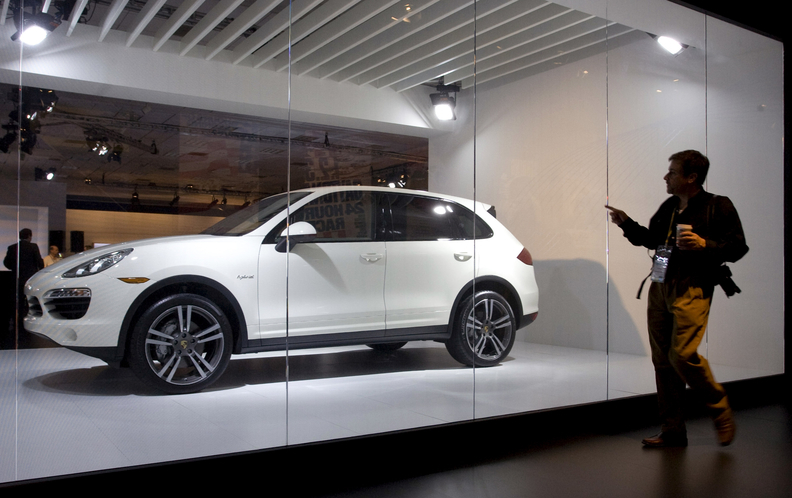 VW CEO Martin Winterkorn said Oct. 19 that the planned combination with Porsche may be put on hold until U.S. lawsuits and German tax-related hurdles are resolved. Porsche is being sued by U.S.-based short sellers of VW stock who claim the manufacturer secretly cornered the market in VW shares and later caused them more than $1 billion in losses. Porsche shareholders will be asked Nov. 30 to approve a capital increase of about 5 billion euros in the first half of next year, with the carmaker's controlling shareholders, the Porsche and Piech families, due to contribute 2.5 billion euros. The capital increase, which may also include selling convertible bonds, will help Porsche pay back a 2.5 billion euro bank loan slated to expire June 30, 2011. Lenders have agreed to give Porsche additional time until Oct. 31, 2011, to repay the facility should the capital increase be thwarted or delayed.